Left, Diane von Furstenberg cuddles up to Anna Wintour. Right, smooching singer Estelle. 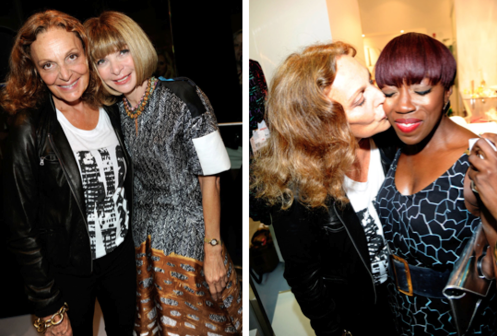 Diane von Furstenberg was full of love last night while hosting guests for the third annual Fashion’s Night Out. The fashion designer and CFDA President rocked a black leather biker jacket and F.N.O. tee of her own design while greeting hoards of customers at DVF’s flagship store in the Meatpacking District. Her friendliness was contagious, spreading to singer Estelle, who performed for screaming fans and shoppers. Not even Anna Wintour was immune! The icy Vogue editrix and brain behind Fashion’s Night Out ditched her scowl and dark sunglasses to make an appearance at the boutique, warmly hugging and kissing von Furstenberg while smiling for cameras. Apparently F.N.O. also stands for P.D.A.